The FACEcraft program is the brainchild of Dr. Rajat Kandhari & Dr. Gargi Basu Kandhari. At Veya Aesthetics we unleash our creative best under this program. By being creative, we mean to enhance aesthetic aspects of your beauty. Aesthetics by definition refers to a philosophy which deals with questions related to beauty and its artistic attributes. As Dr. Rajat Kandhari says, “The idea is to make the shape, form and contours of the face more pleasing and appealing to the eye and achieving an overall youthful and a beautiful face”. So, it would not be an exaggeration if we say that the FACEcraft program is a comprehensive approach to skin rejuvenation. Let’s understand this in detail. Repeated movement of facial muscles underneath the skin, pull on the skin and make our face expressive. It is due to these muscles that we express emotions such as anger, sadness, happiness etc. The excessive usage of these muscles over time result in dynamic wrinkles (wrinkles on movement, for example when one raises his / her eyebrows there are appearance of forehead lines, repeated frowning while reading or concentrating results in lines between the eyebrows, also known as frown lines) . With time if left unattended to these wrinkles may become static, i.e. they are apparent without any movement. Our face has elevators (muscles which help in elevation, such as the muscle on the forehead which results in forehead lines when one raises the eyebrows, or muscles which elevate the lip while smiling etc.) and depressors (muscles which depress the brow, and muscles which depress the lower lip etc.) It is the balance between these two groups which gives harmony to the face and makes it appear refreshed. Therefore, the very first step of this program focuses to restore the natural balance of the face by relaxing the facial muscles. To do so, we at Veya Aesthetics use clinical dermatology treatments including anti-wrinkle injections which is a quick procedure, painless and has no downtime. This treatment gives a refreshed look and restores balance and also prepares your skin for further anti-aging treatments. A good skeletal framework and well defined fat compartments (deep & superficial) provide contour, and volume resulting in a well-defined face. With age along with bony recession one also experiences migration of the deeper fat compartments, the degree of which varies from individual to individual. This results in the formation of lines and folds of the face and the resultant loss of volume is akin to slowly deflating balloon leading to the 4D’s – deflation, descent, disproportion and tissue deterioration. This step of the FACEcraft program primarily addresses the deflation aspect directly and indirectly the descent and disproportion aspect with the help of treatments like Hyaluronic Acid Fillers (HAF’S) which are beneficial in regaining the lost facial volume. As the treatment is called the FACEcraft program, we at Veya Aesthetics believe in crafting the steps to meet individual needs. As per individual needs the program aims to provide the most optimal outcomes after understanding patient needs, goals and motivations but at the same time also educating the patient regarding the best treatment for THEM as this Program aims to provide individualized treatments for each patient as per their facial analysis and what is BEST FOR THEM. for example contouring of the forehead, restoring lost volume in the under eye area, re-contouring the chin and jawline or reshaping the lips etc. In some cases, thread lifts are also advisable for a more balanced look and optimized results. We love what we do and we know how important your beautiful face is, which is why protocols are planned as per analysis of each face rather than following a standardized protocol. Although stringent protocols are followed for sterility, but individualized plans help us provide you with close to perfect results. We at Veya Aesthetics strive to provide you a “WOW” rather than settle for an “OK” with your beautiful face. It is not only the natural process of aging that affects our skin’s appearance but also various factors like sunlight, pollution, smoking, toxins, chemicals and stress causes a lot of damage to the skin. These factors affect the collagen production and as the collagen production deteriorates the skin starts sagging and loses its texture. So, re-draping utilizes fruit peels, hydrotherapy / mesotherapy, laser devices and or fractional microneedle radiofrequency; which help you attain the firmness and an improved texture of the skin. Again, the treatments would be suggested depending on your skin type and specific skin problems. 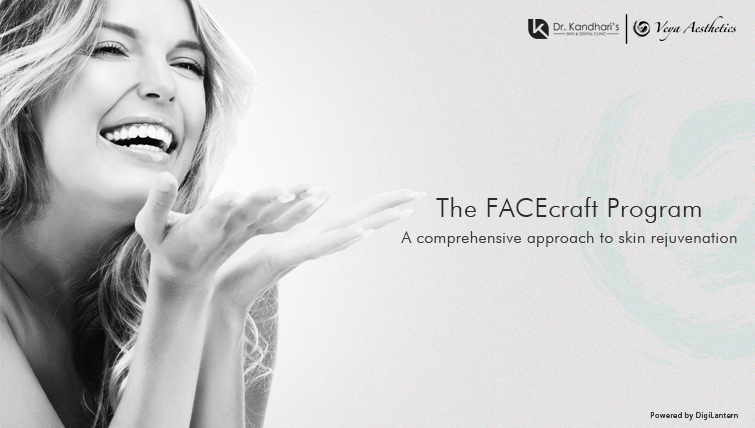 As the main purpose of the FACEcraft program is to provide 360° facial rejuvenation. So, the final step of the program involves correcting the disproportion which may be a result of the aging process or maybe constitutive. We strive for proportion and attain harmony, balance & symmetry giving the face the aesthetic proportion to look your beautiful best. Dr. Gargi Kandhari and Dr. Priyanka Basu work their best to provide you perfect dentition, thereby resulting in a perfectly proportionate face and a gorgeous smile. The process may be graded over weeks to years as per the patient’s personal goals, their budget and their age and involves natural results. So, be ‘beautiful inside, beautiful outside’ with Veya Aesthetics.